The abbey is situated in the middle of the village. On this site St. Patrick built the biggest of his three churches. The abbey is a very simple design with a single elongated nave, with Gothic style windows. Gravestones surround the Abbey, the oldest grave here dates back to 1006. This abbey belonged to the 3rd order of St. Francis and was built on the site of St. Patrick’s church. 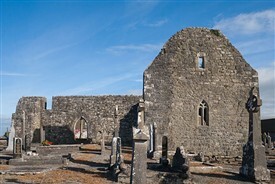 Kille Abbey is situated about one mile off the main Shrule – Kilmaine Road in Co. Mayo. Outside the abbey wall there is a stone with a hole in it, large enough so that a clenched fist can fit into it. This stone is about a meter and a half above ground level, and out from it on the ground at four meters is another stone. Legend has it that if you stand on one stone on the ground and walk towards the wall with arms outstretched and eyes closed, and if you manage to get your hand in the hole within three attempts you will have your wish granted. Others say that you have secured a place in Heaven. Thank you for such interesting information. My ancestors, the Gilmore family, lived at Deerpark and my Great-Grandfather, Daniel Gilmore, worked at Dalgan Park for the De Clifford family. 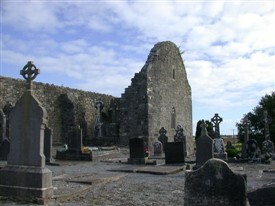 The Gilmores are buried in the grave with the large cross shown at the top of the photo by the Abbey (to the right of the Abbey). If anyone has any information about the Gilmores, I'd be very grateful. My grandmother Katie Murphy was from Kilmaine/Shrule Ireland. As there are several Murphys, it is hard to determine any information on her family who remained. She came to U.S. in 1909 with a cousin Celia Gibbons from Galway. Katie Murphy's mother was Katherine Gibbons Murphy. Several siblings remained in Ireland. I hope one day to visit Kilmaine. It is a great website and I thank you for it. Editor: Thank you for your support and you may get some replies from other interested supporters for Kilmaine etc. over the next few months. My wife and I visited the Kilmaine Abbey this past July. We were grateful to find my great, great, grandparents headstone (John & Anne Flanagan) in an O'Connor plot. They were from Killernan. The O'Connor connection was their youngest daughter Nora married an O'Connor. Her son is buried there as well. John Flanagan's fathers name was David. There was also a Thomas with family in the area. I beleive he was John's brother. Kilmaine was a bright and well maintained village. Theresa at the Community Center was a dear and helped us tremendously. We plan on returning.